Stine Seed Farm has invested $5 million in Smart Ag Inc., an Iowa technology firm that has developed a full stack software platform and aftermarket kit for driverless tractors. The Stine Seed investment In Smart Ag’s Series Seed Round comes just five short months after Smart Ag unveiled its technology with the release of AutoCart, a software application that fully automates a grain cart tractor for use during harvest. Founder and CEO of Smart Ag, Colin Hurd, said the value of the Stine Seed investment extends beyond the financial aspects because of Stine Seed’s reputation for innovation, technology and putting farmers first. “One of the true champions for American agriculture is Harry Stine – someone recognized globally for his dedication to discovering new technologies and utilizing science to make farming more profitable,” Hurd said. 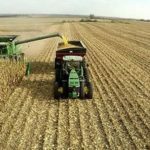 “This investment from Stine Seed represents their belief in what we’re doing at Smart Ag to address the issues of labor, profitability and productivity for today’s farmer.” The AutoCart application provides a solution to one of the biggest challenges facing every farmer – critical labor shortages during harvest. Smart Ag’s driverless tractor technology is the first step towards “enabling perfect operation of farm equipment”. AutoCart performs the same function as a driver, only it is safer, and more reliable and sustainable. Over two years in development, AutoCart, along with the tractor automation kit, is a plug- and-play system that automates existing grain cart tractors. The cost of the system is comparable to retrofitting a sprayer or planter with precision technology. The AutoCart technology is available on a first-come, first-serve basis, more information can be found on the Smart Ag website: www.Smart-Ag.com.